to make the Make Up Your Mind tank by Julie of Knitted Bliss. I fell in love with the Mr. McGregor’s Garden comfy sampler from Knit Picks (unfortunately not available anymore) and decided I would find a pattern for it once I got it. I tried to make my own first, but that didn’t work out quickly enough because I wanted this to be my project on vacation. After a little searching and swatching, I decided Make Up Your Mind was what I wanted. I cast on provisionally for the 40 in size since my gauge was a bit smaller and I wanted it to be a little more flowy since it would be going over another shirt. I did mostly stick with length measurements from the 34 in size, except when it came to how many times to repeat decreases. Actually, I fudged a lot of the numbers because I kept getting off with the stitch patterns and would just decrease until I had an ok amount for the pattern. I was on vacation; I didn’t want to have to actually count my stitches. This pattern was fairly easy to work, and very easy to follow. I’d say it’s a good bridge between beginner and intermediate skill sets.If you can knit, purl, yarnover, increase and decrease, you can make this pattern, too. Best of all, no sewing seams! You just graft the shoulders together and weave in the ends and you have a ready-to-wear shirt. After our week in Paris, we moved down south to the region called the Dordogne. The town was named Montignac. It’s a small town, although much more upscale than most of the small towns here in America. It is also the location of Lascaux, the oldest found cave paintings in the world. We took a tour through Lascaux II, a reproduction of the original cave which is now closed to all people. Unfortunately, you can’t take pictures inside the cave, but it was impressive to learn how the prehistoric people used scaffolding and oil lamps to paint on the top parts of the cave walls. Another place we visited but I didn’t take pictures of was this prehistoric cave that had been inhabited well into the 14th or later centuries. It started as a cave that was steadily built around to create a fortress. They also built up about five stories, working with the natural cave behind to create rooms. Being an ancient fortress, there were also some pretty disturbing parts, dungeons and torture devices and such, but the way they built the fortress and how they lived in it was interesting to learn. The second week was much more relaxing and vacation-like. Less running around trying to “see everything.” After the over-full week in Paris, we all needed it. This whole trip was my first time out of the country. Did I mention I speak zero French beyond “merci,” “bonjour,” and “au revior.” Which makes me wonder: Have you ever been out of your home country? Did you speak the language, or were you as lost as I felt trying to navigate transactions without speaking? Where is your favorite place you’ve ever been? I know I promised these pictures on Friday, but I was folding mountains of clothes and packing and shopping and then got caught in a cooking frenzy. Saturday I was out and about, and Sunday I did even more cooking. So, here are the promised picture of my trip, a weekend late. Mind you, this won’t be all of the pictures. The full 110 are posted in this album on my G+ page. Most of them are captioned, but there are a few I know are of landmarks, but I haven’t figured out what landmarks just yet. 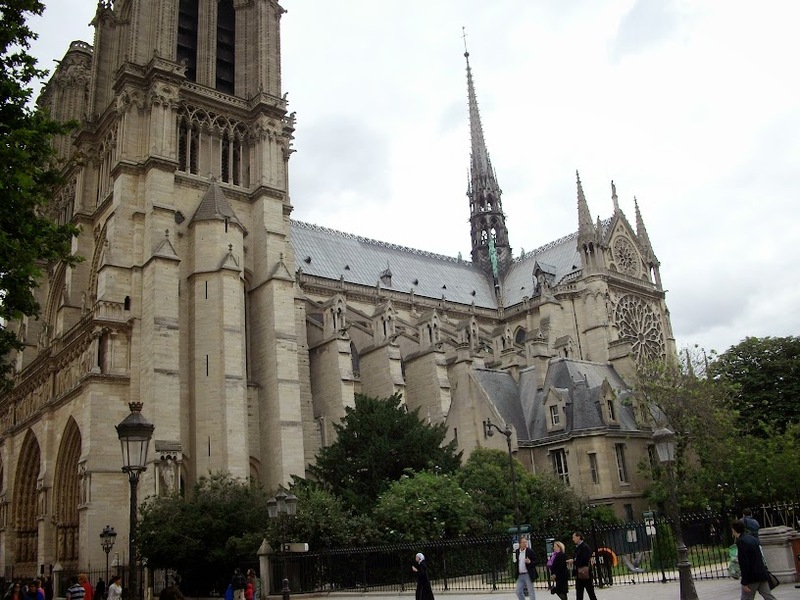 After spending at least a few semesters studying it in pictures, I couldn’t be in France without seeing it in person. It was seriously impressive, and hopefully my pictures do it slightly better justice than the tiny pictures in my textbooks. I also loved being able to walk down the river. There are so many interesting boats parked along the bank and floating down it at all times. 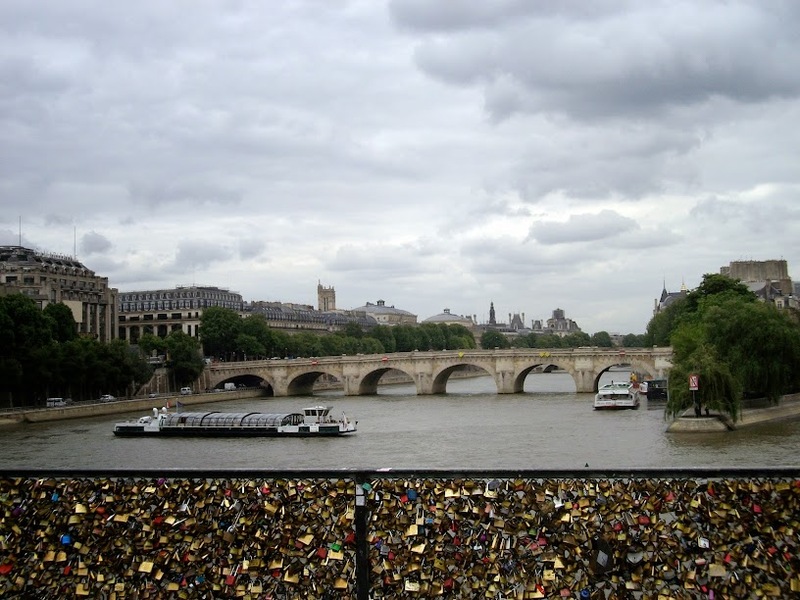 Because the Seine river runs directly through the center of Paris , there are plenty of bridges to take you from one bank to the other and provide great views at the same time. There are a couple bridges with an interesting tradition. 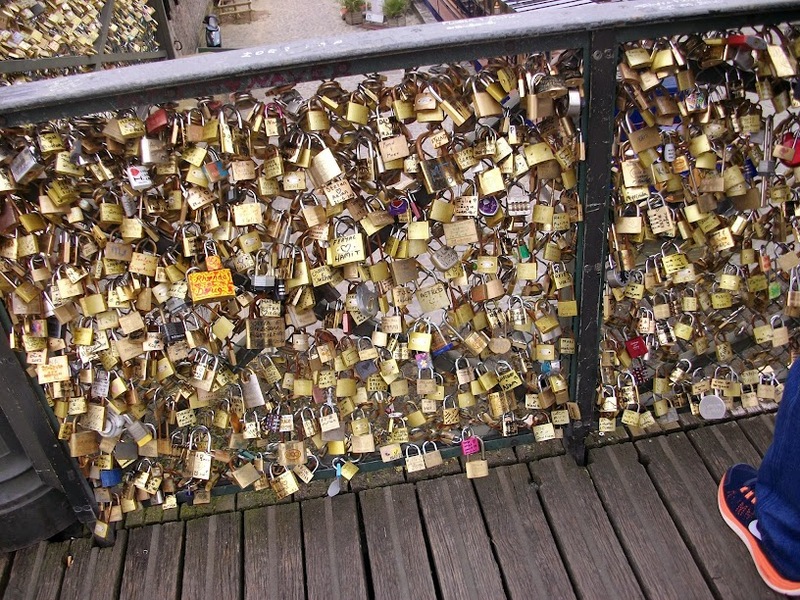 Couples and families write their names on locks, lock them to the bridge, and throw the key into the water to symbolize love lasting forever. 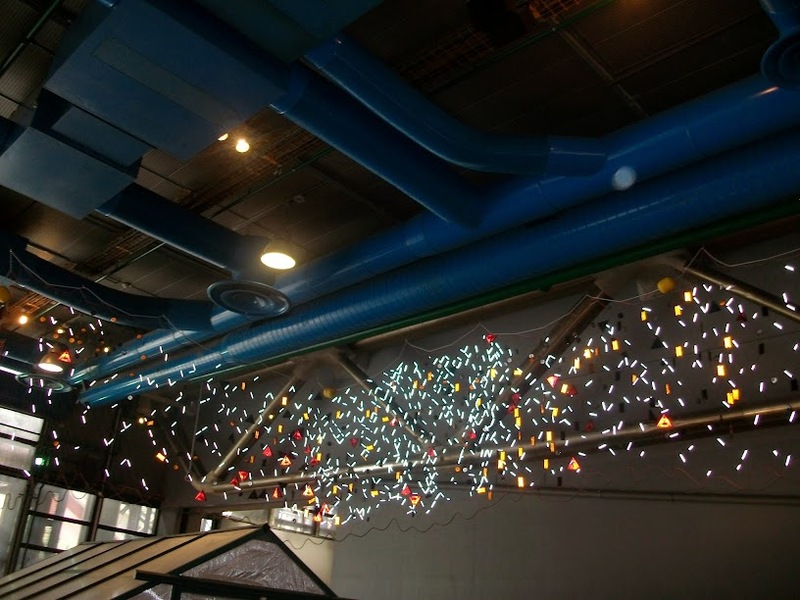 Another thing you must see in Paris? 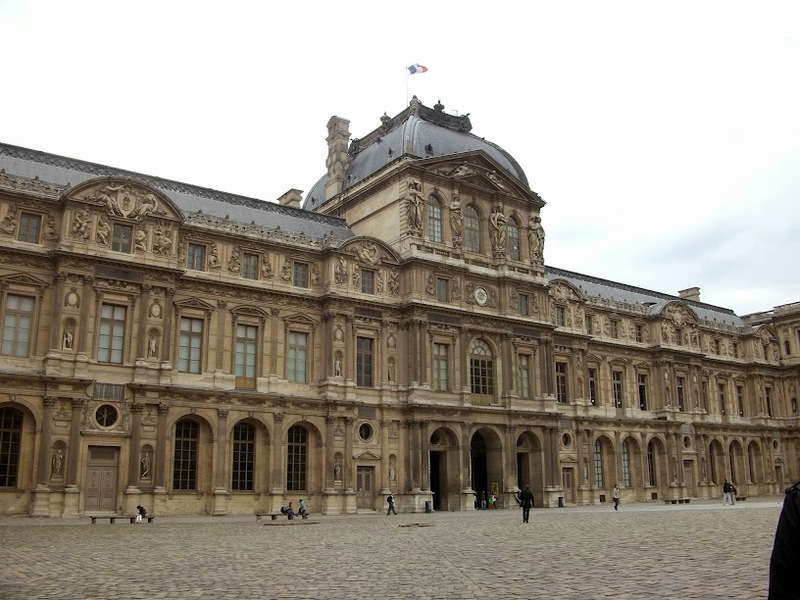 The Louvre, of course, and it is massive. 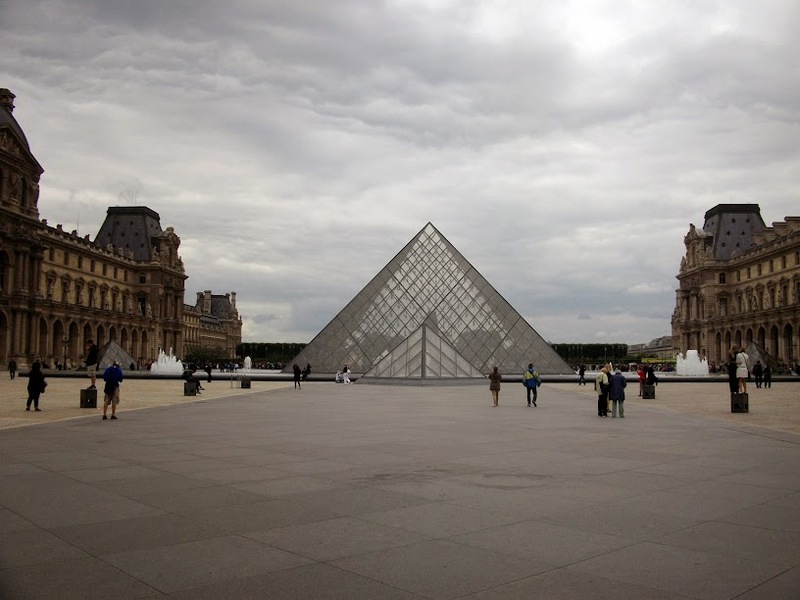 Especially the famous glass pyramids and fountains in the center. 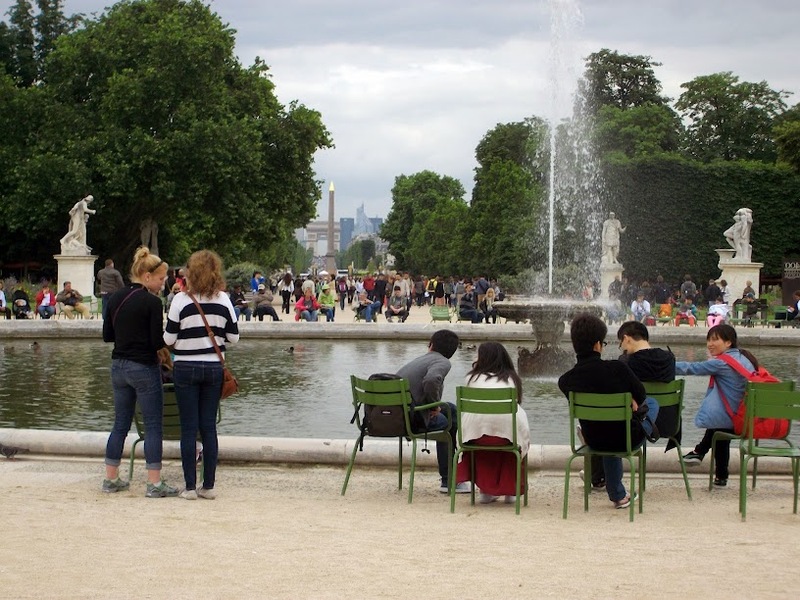 From the Louvre, you can walk straight into the Tuileries Gardens. 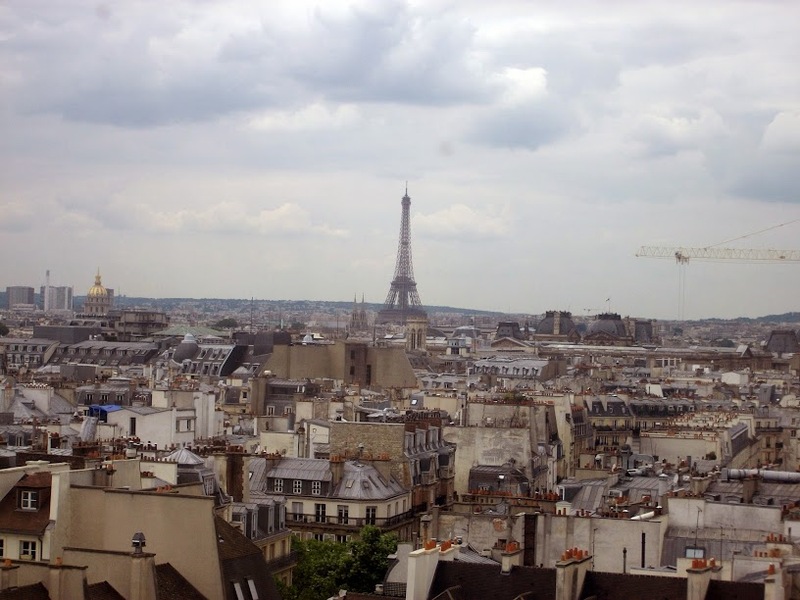 There are fountains, flowers, trees, and a view directly down the center of the Obelisk and Arc du Triomphe. 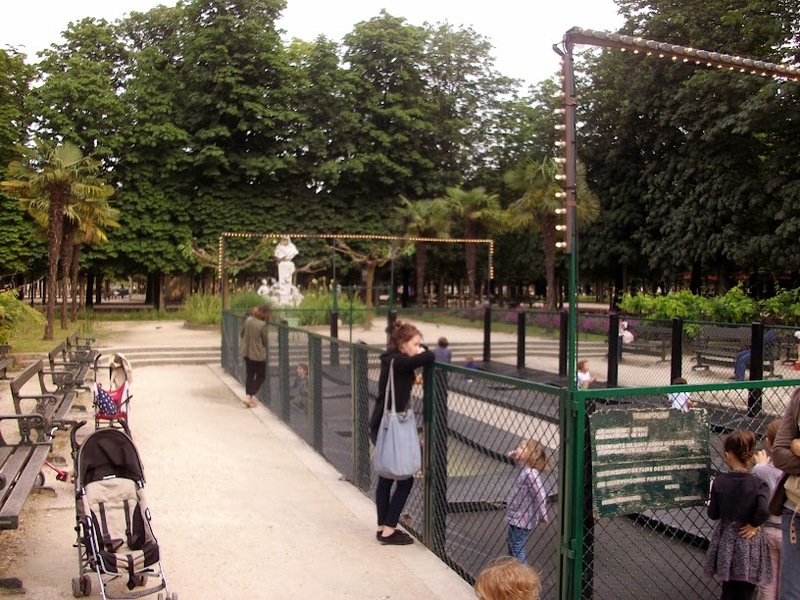 That’s right, there is a park full of trampolines in the middle of the gardens. Pretty awesome idea, really. 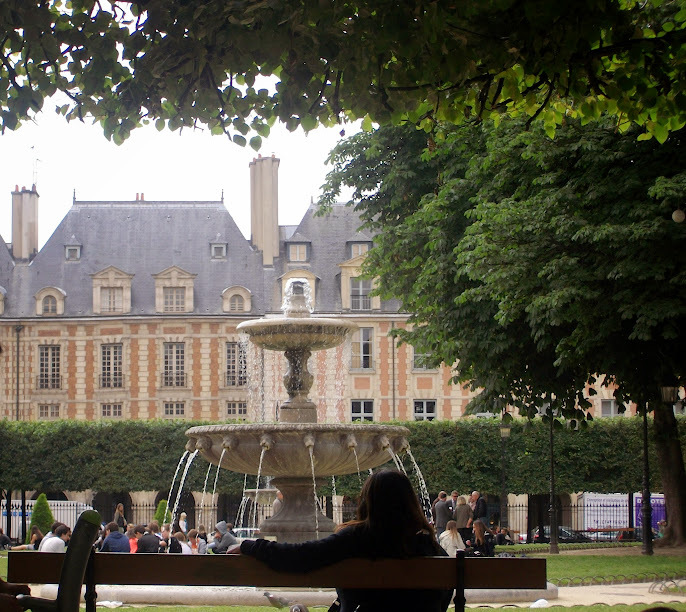 Another great park in Paris is the Luxembourg Gardens. I think it was actually larger than the Tuileries. 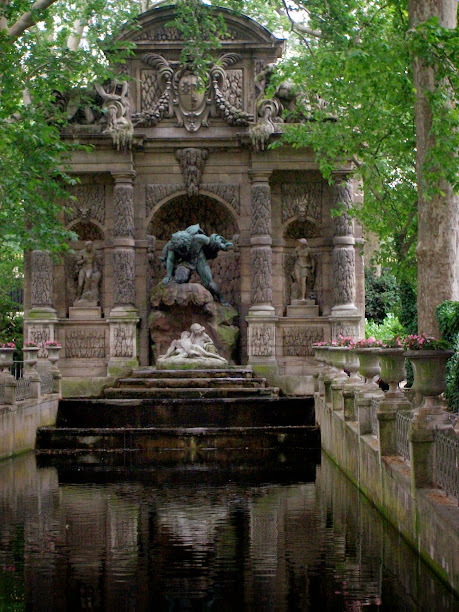 It has a large reflecting pool and statue near the side entrance. while the inside is a modern art museum. All the exhibits I saw were cool, but I think this one was most impressive. When you see it in person, it doesn’t look like much. Just a net with some reflectors. But when you take a picture, it lights up in your camera display. 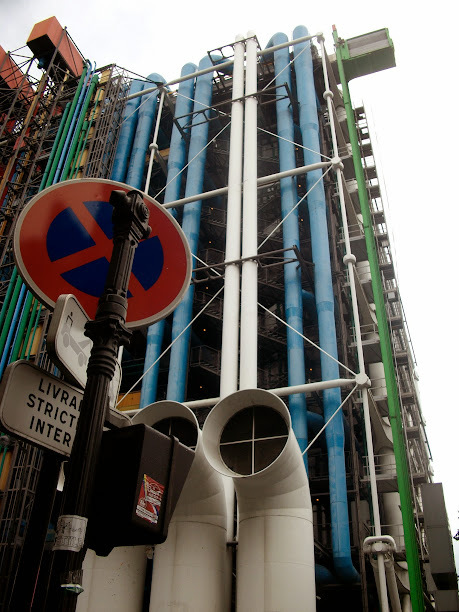 At the top of the Pompidou Center, you can look out and see all of Paris. That’s where I took possibly my best picture of the Eiffel Tower. We went to it, but you can’t exactly take a great picture of a giant structure standing at the foot of it. The baby and I took a walk to the Place du Vosges one day after a particularly long nap (his, not mine). It has some wonderful fountains. 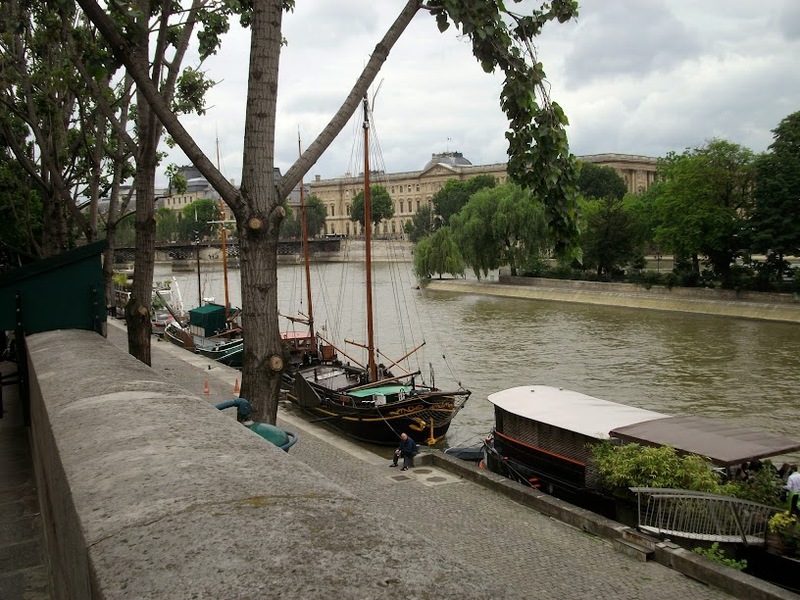 Another day we went with the older kids and their dads on a boat ride down the Seine. 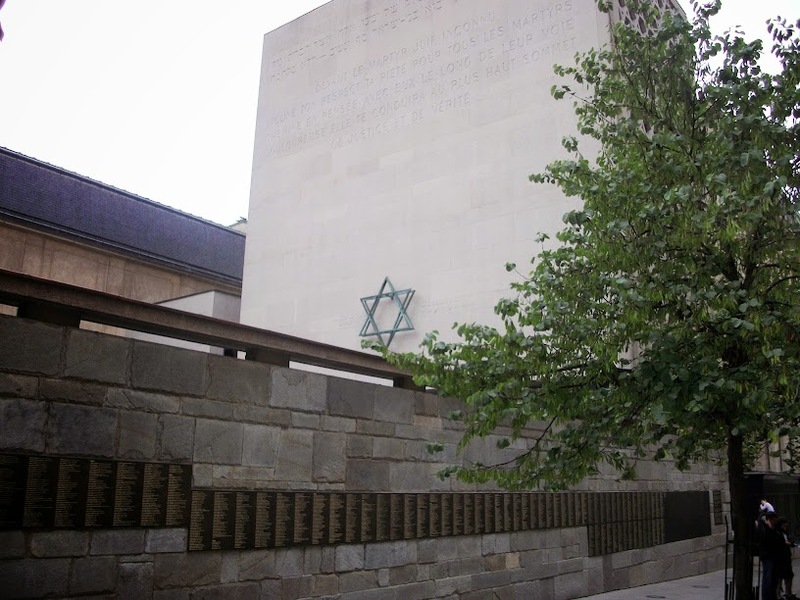 on the way we saw the Memorial des Martyrs de la Deportation, a memorial to those who helped the Jewish people escape France in Word War II. It was really eye opening to see all the names of people who were willing to risk their lives to help their neighbors and friends, and sometimes even strangers. That pretty much sums up my first week in France. To keep this post from being too incredibly long, I’ll post about the second week on Wednesday. It will be less pictures, but still as interesting. No, not one of those virtual vacations where you look up the place you wish you had the money to visit on Google Maps. I’m talking about the vacation I took away from the Internet over the last week and a half. I was house-sitting for the family I usually babysit for while they took a trip. It was just me and the two giant dogs in an empty house. Considering this took the place of my normal work week, I had a lot of free time. Usually, I would spend said free time messing around on the Internet or playing games on my iPod over the internet. This time, though, I didn’t have an Internet connection. It was actually wonderful. I still used my computer a lot, but I got things done on it. I learned how to use Flash, I wrote almost 5,000 words on a story I’ve been trying to get started for a long time, and I did a lot of reading. Finished three books in a week. Then there was the just plain creative time I had. I knit two pairs of gloves (which you will see on Thursday), drew my first fashion illustration in a while (coming next week), and spent a lot of time singing and practicing on my guitar. It got me thinking about all the things I could get accomplished in the afternoons when I do work if I were to limit the time my Internet connection was running. So, for at least the next two weeks (because then I am supposed to be without Internet again for a week), I am going to try turning off the Wi-Fi connection on my computer until 4pm*. That’s when I usually sit down and start watching TV for the evening, so my productivity is beginning to wane at that point anyway. That way I will hopefully be able to get more things done. Who’s with me? Does anybody else sit down at the computer to “check something quickly” and then look up to see that three hours have flown by? *Except when I actually have something to do, like post this. But that is still being productive since it’s something I can mark off my to-do list for the day.